Categories: Alteryx | Tags: #TBT, nostalgia | Permalink. Categories: Alteryx | Tags: detour, Excel, macro | Permalink. One of the really great strengths of Alteryx is that is can handle any amount of data that you throw at it. If your data is small enough, it might all be in memory, but when Alteryx gets more data than fits, it silently swaps out to disk. This way people are routinely processing data sets that are 2, 10 or even 100 times bigger than they have enough memory for! Categories: Alteryx | Tags: macro, RegEx, Regular Expresions, summarize | Permalink. One of the most common questions I get about Alteryx is: “How can I make my module run faster?” Although Alteryx can be very fast, since it is such a general tool, it is only as good as the module that you have authored. There is a very simple guideline that you can follow to make a module faster: do less work. The most common example of doing less work is to use the select tool as early as possible to remove fields that you are no longer using. In order to walk you through the process I use to make an Alteryx module run faster, I am going to walk through the process of optimizing my Percentile Macro to run as fast as possible. Categories: Alteryx | Tags: macro, Optimizing | Permalink. Update – there is an updated version of this macro in the post: Alteryx: Optimizing Modules for Speed. Percentile: Calculates the specified percentile value for the group. The percentile is calculated by sorting the data and returning the row value relative to the specified percentile and its position in the sorted array – the largest value is the 100th percentile, lowest value is the 0 percentile, median is the 50th percentile, the 25th percentile is the value in the middle of the median and minimum, etc. 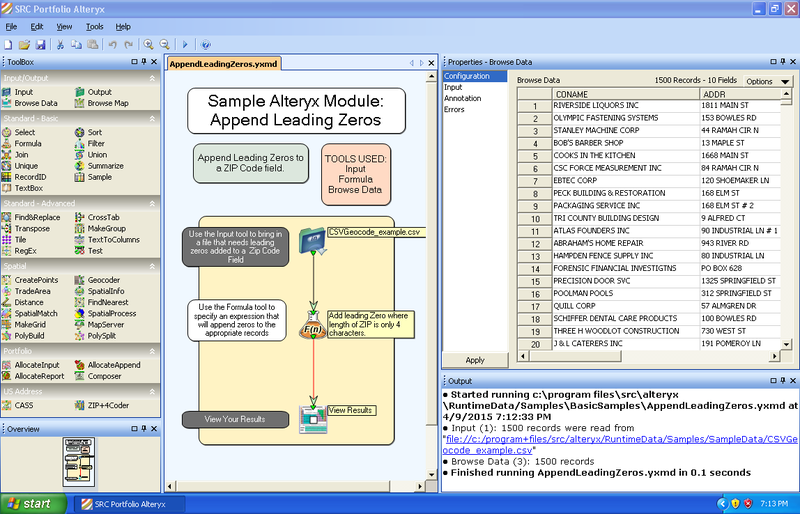 Categories: Alteryx | Tags: macro, summarize | Permalink.